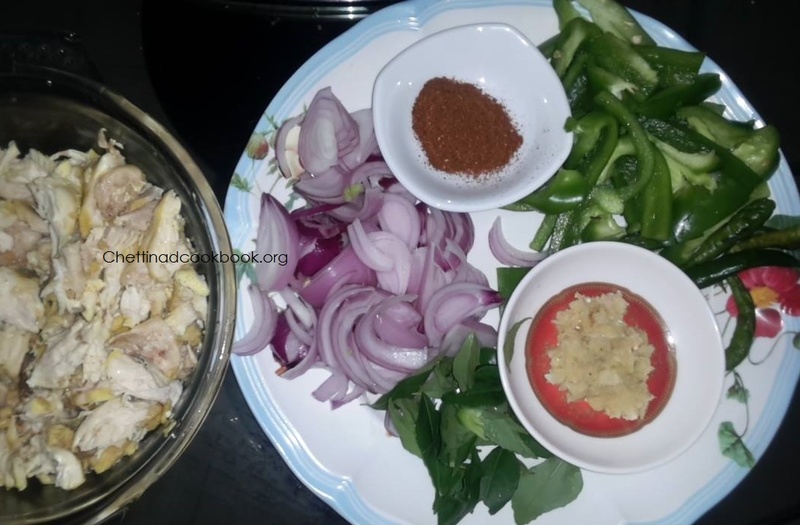 Delicious Chicken Kaima Varuval is easy and simply awesome dish which can be enjoyed by all age people, complete taste of chicken can be savoured in this form of Kaima Varuval. Chicken boneless tossed with freshly ground pepper and vinegar,spicy and tangy flavoured dish ,awesome combination with Roti chappathi this can be filled inside as stuffing’s in chapathi and roti,also delicious chicken sandwich can be prepared with this Chicken kaima varuval. Chicken-1/2 kg(boneless) or boil and remove bones from it. Boil chicken for 2 whistle make in to small pieces, minced roughly. Note: Do not discharge the chicken broth can be made in to chicken soup. Cut Onion and Capsicum lengthwise pieces,Green chilli crosswise. Heat pan with 3 tsp of oil, add Garam masala powder and ginger garlic paste ,saute well. Add Onion,Green chilli,Curry leaves and Capsicum to it saute for a while, add cooked and minced chicken,mix well. Add Salt ,Turmeric powder and chilli powder,add chicken cooked water(Chicken broth) only 1/2 cup to mix with all. Finally add Pepper and Vinegar or lemon to the Varuval and mix well stir in low flame for 3 minutes,add chopped Coriander leaves. Transfer and serve with chappathi or any Fried rice.